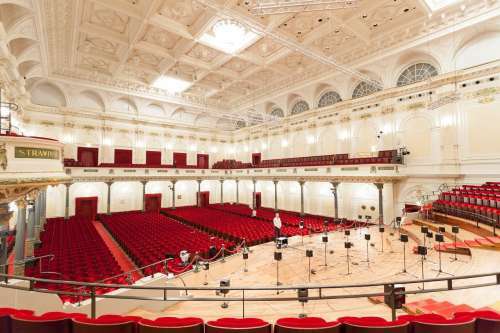 Concert hall acoustics – but on whose terms? In recent years, concert hall research has been raised to a new level with a method developed at Aalto University in Finland. This enables the authentic auditing of concert hall acoustics in a laboratory. “We can’t hear anything!” an audience member shouted to tenor Jonas Kaufman in the middle of a concert. This outburst by a frustrated concertgoer seated behind the orchestra at the Elbphilharmonie in Hamburg revived a perennial debate: how is it possible to build a concert hall which costs EUR 800 million but where the audience cannot hear the soloist? After all, the acoustic designer was supposed to be the best acoustician in the world, backed up by computer simulations, scale models and an army of engineers! In today’s world, new concert halls are massive construction projects that, when completed, are hoped to become tourist attractions in their respective cities. This was certainly the case in Hamburg, where the glittering Elbphilharmonie perched on the Elbe River appears in nearly every tourist brochure published in the city, and concert tickets are sold out six months in advance. Music tourism is booming, and the hall has been widely acclaimed, particularly its architectural design and its foyers. The new Music Centre in Helsinki was inaugurated in 2011. It was hoped to inject a new enthusiasm into musical life in Helsinki and all of Finland, and indeed in this it was successful, because the Music Centre often sells out its classical concerts. Yet it never became the projected tourist magnet for Helsinki. The design competition was won by an entry named a mezza voce [in a low voice], and true to this description the huge building is almost imperceptibly slotted into its central location. The design competition was held two decades ago – perhaps the result would be different today? The Elbphilharmonie in Hamburg and the Music Centre in Helsinki share not only sold-out concerts but also the awkward fact that the acoustics in their main concert halls are not quite what was promised, and both have been criticised ever since their inauguration. Both were designed by the same acoustic designer, and both have the same shape: the stage is in the middle of the bowl-like hall around which the audience is seated in raked tiers like at an ice rink, many audience members being seated beside and behind the orchestra. In these seats, the balance of the orchestra is very different than out front, and it is sometimes really difficult to hear the soloists. The main concert hall of the Helsinki Music Centre. The aforementioned experiences of audiences and critics alike are corroborated by the most recent research findings: modern concert halls are unsatisfactory for symphonic music. The bass register lacks warmth and power, the strings and brass lack brilliance, and nowhere in the auditorium does the music embrace and envelop the listener. These circumstances serve to make the listening experience somewhat flatter, since the dynamics of the music played on stage is not conveyed to the listeners. The acoustic designer may talk as much as he pleases about the visually intimate space created by the audience gathering around the orchestra, but on the whole the feel of the hall is anything but intimate. There are several arena-type concert halls like the Elbphilharmonie and the Helsinki Music Centre out in the world: in Los Angeles, Copenhagen, Shenzhen, Miami and Paris, and a new one is being designed for London. They all share the same acoustical problems, which begs the question: have we not learned anything? Why do we keep building halls like this if they do not serve the music performed in them and provide listeners with powerful auditory experiences? How is it possible that no one can design a better acoustic, even though concert hall acoustics have been scientifically studied for more than a century? There are several possible explanations. Concert hall design may be governed by factors other than acoustics, or else the designers do not know or do not care about acoustics. In the case of all of the halls referred to above, the acoustic design goes back to one particular acoustic designers’ office, whose sound ideal is obviously something quite different than an expressive sonic bath. Designers speak of visual intimacy and of gathering around an orchestra but do not openly explain their acoustic goals. It would appear that design is being governed by current architectural fashions, visual aspects and having clear lines of sight to the stage from everywhere in the hall. In other words, the guiding principle is that the audience comes to see the orchestra at work and that the concert experience is dominated by visual information above all else. "The next goal is to get the hall-designing consultants to not only read but also believe the most recent research findings"
The acoustics of concert halls have been studied scientifically for more than a century, and how sound behaves physically in an enclosed space is already quite well understood. The sound of a musical instrument radiates in all directions, albeit at varying dynamic levels depending on the instrument and the notes played. The sound is conveyed from the stage to the listener directly, besides being reflected off the walls thousands of times. These reflections constitute reverberation, which enriches the sound and creates the acoustical foundation that ties phrases and harmonies together. There is ample information available on the properties of wall materials and shapes, and computer simulations can predict sound reflections very accurately. 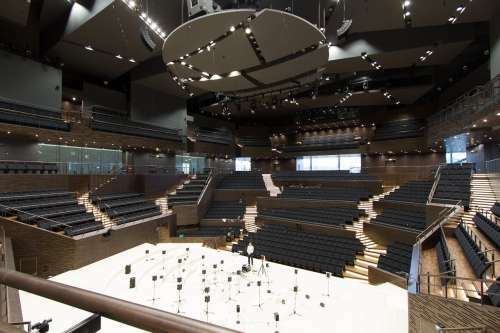 Major concert hall projects include the building of scale models in which acoustics can be physically measured (with certain limitations) before the actual hall is even built. In other words, the acoustics of a concert hall can be predicted to a considerable degree of accuracy on the basis of the architect’s plans, and those plans can thus be tweaked as necessary to achieve the acoustics desired. The biggest problem in determining what a good acoustic should be is the human element. It is difficult to measure an individual listener’s musical experience in objective terms, let alone relate that experience to the physical properties of the sound in the hall. The traditional way to explore this dimension is to distribute questionnaires to audience members and to canvass their opinions. The challenge here is how to control for variables: the results can be influenced hugely by the music performed, the visual information, the respondent’s state of mind or something as apparently trivial as how smoothly the interval refreshment service runs. Also, respondents interpret questions in different ways. Recordings and acoustics simulations have enabled laboratory research, in which controlling for variables is substantially easier. Simple simulations have uncovered many factors that improve sound quality, such as early reflections off side walls and the level of reverb surrounding the listener. In recent years, concert hall research has been raised to a new level with a method developed at Aalto University in Finland. This enables the authentic auditing of concert hall acoustics in a laboratory (see the article here). The tools and methods developed allow an extremely precise comparison of concert hall acoustics, and the sensory evaluation methods developed in the wine and food industries have been employed in controlled listening experiments. These methods make it much easier to understand the differences between halls and to appreciate why acoustic preferences vary between individuals. This methodology as a whole has expanded the scope of the research into a multi-discipline pursuit requiring expertise in physics, sound technology, measurement technology, signal processing, music, perceptual psychology and statistics. The shoe-box shaped hall of the Concertgebouw. This brings us to the concert hall design process, which is a chapter unto itself and undoubtedly one of the factors underlying the problems with concert halls. In Helsinki, for instance, the process took more than 20 years, with multiple branches and hundreds of people. Many of the people who had launched some of the branches in the project had not been involved for many years by the time the Music Centre was inaugurated. The main conclusion from the concert hall design process is that the opinions of musicians, particularly conductors, are crucially important at the beginning stage of the process, when determining the basic shape of the hall and selecting the acoustic designers. This is only natural – after all, it is the musicians’ workplace that is being designed. Musicians tend to recommend an environment where it is easy for them to do their job, to hear each other and to be the focus of the audience’s attention. In vineyard-shaped or arena-shaped concert halls, conductors tend to be the centre of attention, and it is easier to be in contact with the audience. However, while this kind of setup may be great for ensemble playing within the orchestra, the excellence tends not to carry any further than the centre point of the hall, i.e. the conductor’s podium. The audience at large is never consulted regarding the shape of the hall or the acoustic designers. There is a tendency to create ‘wow’ architecture for the purpose of attracting large numbers of tourists. Considering all this, it is hardly surprising at all that buildings like the Elbphilharmonie and the Helsinki Music Centre continue to be built. It is concertgoers who are left with the short end of the stick in this approach, as these halls virtually never allow listeners to be immersed in and surrounded by the music like in the great traditional shoebox-shaped concert halls in Vienna, Amsterdam or Boston. For scientists, the next goal is to get the hall-designing consultants to not only read but also believe the most recent research findings. Many designers seem to be designing concert halls according to their personal convictions, without much regard for other people’s opinions or scientific data. 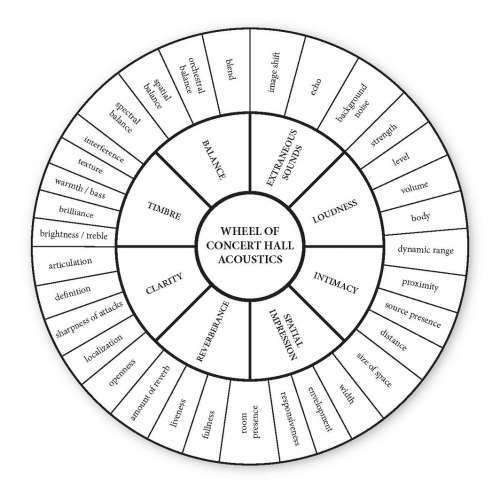 Wheel of Concert Hall Acoustics, developed by Tapio Lokki and Antti Kuusinen, represents one possible organization of the perceptual aspects and attributes that are often used to describe the acoustics of concert halls.